A little color, a little fun. 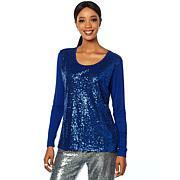 This top celebrates fashion and gives you unlimited options for wearing it. Try it with jeans, trousers … skirts and shorts. So many options, so little time. I love this beautiful top. The fabric and cut of the garment is extremely comfortable. It does run large, so you may wish to size down a size. Im very glad I ordered this top. Joan is the best, and knows what looks good. I have this top in blue and love it. Its very soft and comfy. I found it to run 2 sizes too large on me. Thanks Joan for such a beautiful top. It was a perfect fit I bought a 1x in black/white and it looked great on me, even my husband commented on how nice It looked. The material is nice and soft and it drapes nicely. I found a new clothes line with a little bling! Thanks Joan and HSN! Ordered the turquoise/black. Very pretty and comfortable top. Runs generous. I am 5'5/140 and the Medium is a perfect fit. I ordered the turquoise with black top and I love it. I usually wear a Large or an XL and I ordered a Large in this top and it fits perfectly. It is a lovely top and I cannot wait to wear it!